It's been three months since the reprinted version of Gloomhaven hit my doorstep. The doorstep is still recovering from the blow. In all that time, we'd only gotten as far as unpacking, punching and sorting it all out - but now we finally get to play! 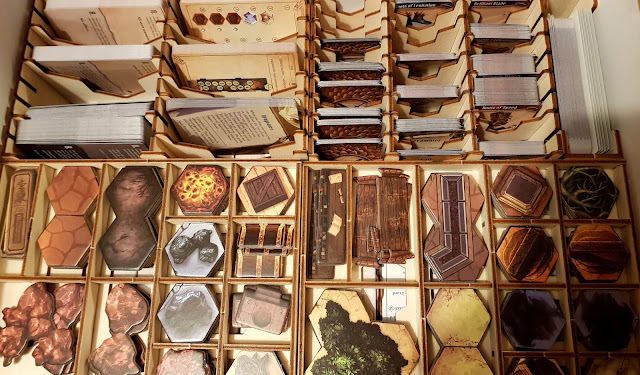 Having revolutionised the setup of my copy of Scythe with the brilliant Broken Token insert, my first move was to pack everything into their (also completely brilliant) insert for Gloomhaven. 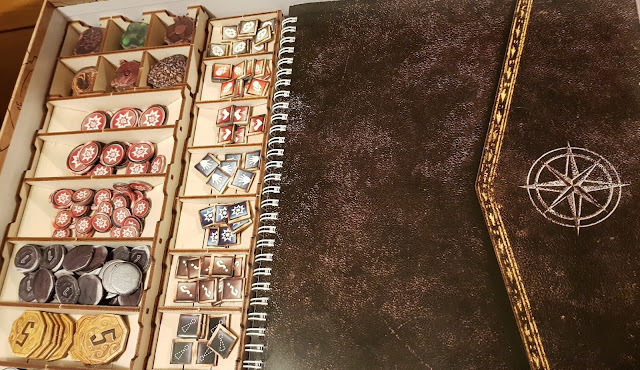 The price is steep, and I spent a good few hours covered in PVA glue, but even after just one session it feels like the insert has paid dividends in time saved. The inclusion of labelled monster tuckboxes has really helped us find things quickly as beginners and it makes a nice change not to have the table awash with ziplock bags. Packing away takes barely any time, and most of that is me trying to remember what order the trays get packed away in! I'm reliably informed that I could have done without the insert, but I don't regret the investment for a moment. 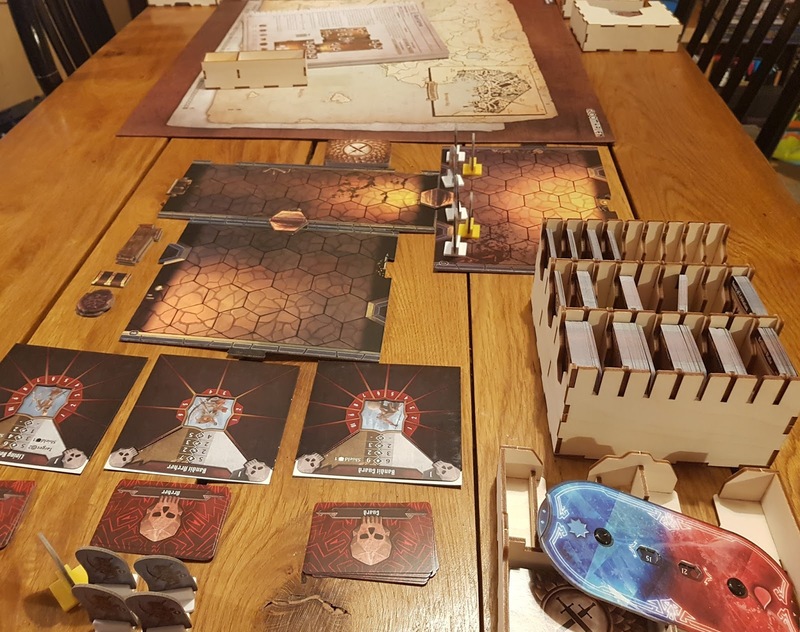 Cephalofair games wisely commissioned Paul Grogan of Gaming Rules! to put together their how-to-play videos for Gloomhaven, which were required pre-game viewing for everyone involved. 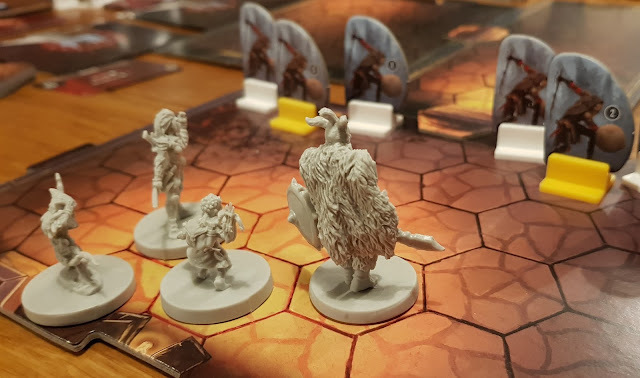 These are a great introduction to the game and make sure that everything is nice and familiar when you get to the table, even if you have to look things up again once you get going. The big day came, and it was time to form a party of brave adventurers. Setting up the night before meant we were totally ready to go when everyone arrived and got straight into picking characters. With a Brute, Mindthief and Tinkerer already selected, I was left with a choice of Spellweaver, Cragheart or Scoundrel. All of these sounded exciting just from their names and I found it so hard to pick that in the end I closed my eyes and went for 'random'. 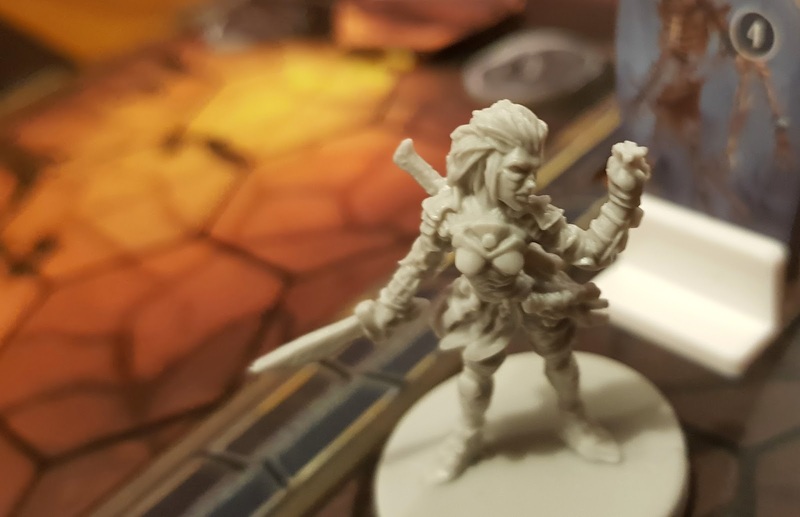 Enter Kerilya the Scoundrel (thank you, random name generator!) ready to delve into the Black Barrow in the ever-so-appealingly-named Corpsewood. My trepidation about our impending doom was somewhat lessened by being allowed to put a little location sticker on the board, a feeling I've been missing since finishing Pandemic Legacy: Season 1. This session was very much a learning game, with a lot of time spent poking through the rulebook and figuring out how our characters worked (not helped by the fact that I'd forgotten about the handy player reference cards and didn't hand them out...) It took us the whole rest of the evening to get through the first room of the three-room starting scenario, but by the end of the night we had a much better grip of what was going on and I was excited for our next game. All the mechanism seem to fit together really nicely and I can see how deep the strategy and co-operation could go. A random selection of my favourite things so far: earning XP through using your character's moves, easy to follow monster rules, dreaming about all my future character upgrades, brilliant artwork. Hopefully next time we'll get to finish the Black Barrow and see what lies beneath!